More than 60 million Americans suffer from hammertoes, causing discomfort, irritation and insecurity about foot appearance. The progressive condition that causes toes to take on a curled position (thus resembling a hammer from the side) can impact your daily activities and make it difficult to find shoes that can be worn comfortably. Much like bunion surgery, hammertoe surgery is often thought of as an undertaking that will require plenty of elevation time and a long, drawn-out recovery. To busy New Yorkers, this often seems like an impossible commitment to fit into an active lifestyle. Fortunately, there’s a new hammertoe surgery in NY being offered at Extend Orthopedics that straightens toes with a faster recovery time. Here’s an overview from orthopedic foot and ankle surgeon, Stuart Katchis, M.D., about the hammertoe correction surgery that’s performed using the cutting-edge Nextra® implant system. 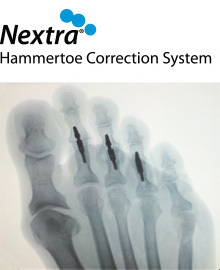 Nextra® is an advanced hammertoe correction system that uses a proprietary implant device Dr. Katchis helped develop. Nextra® is the industry’s only adjustable two-piece hammertoe implant and it offers numerous advantages over traditional hammertoe correction surgeries. It is an arthrodesis (fusion) procedure that mends the affected bones through surgical fixation of the interphalangeal joint(s) in the toe. After removing the deviated small joint(s) in the affected toe, Dr. Katchis will insert the proprietary Nextra® implant, which can be customized to each patient’s unique toe anatomy. The device enables the bones to fuse together and heal in a flat position over the course of several weeks. What are the advantages of the Nextra® hammertoe surgery system? The ability to bear weight sooner is a primary reason why this surgical fixation system stands out among other options. Unlike traditional hammertoe correction surgeries, the Nextra® system is completely wireless, meaning there are no wires or pins inserted or sticking out of the toes for weeks following surgery. In effect, patients can return to normal activities and work much sooner, bathe with greater ease and sleep more comfortably, unencumbered by wires and pins. Without the use of wires or pins there is also a reduced risk of post-operative infection and, since the implant stays within the toe, there’s a reduced chance of the hammertoe returning. While the Nextra® system has many advantages that benefit the patient, it is advantageous to the surgeon as well. Through its unique patented features, Nextra® offers greater control in adapting to a patient’s individual anatomy versus adapting the patient to the implant. The innovative design provides an equal combination of precision, adjustability, bone-to-bone apposition and stability. All in all, these factors add up to a more successful hammertoe surgery for you, the patient. How do you know if you need hammertoe surgery? Since hammertoe is a progressive condition that gets worse over time, only those patients who seek treatment in the early stages tend to have favorable outcomes by nonsurgical means. There are a number of ways that hammertoe can be reversed without surgery if the condition is treated while still in the “flexible” state. For those patients who know that their hammertoe has advanced beyond the early stages or if you’re not sure what stage your condition is in, the best way to determine whether you need surgery is to consult an orthopedic physician who specializes in the treatment of hammertoes. Interested in learning more about our hammertoe surgery in NY? You can schedule a consultation with Dr. Katchis to learn more about this new hammertoe surgery in NY and to find out whether you’re a candidate by filling out the appointment form on this page or by calling our office at 212-434-4920. We offer two practice locations in NY – one in Manhattan and one in Scarsdale. On top of the numerous advantages of this procedure, the Nextra® hammertoe surgery is also reimbursable by most insurance companies. Want to hear from a patient who underwent the Nextra® procedure? See what Dr. Katchis’ patient Gail has to say about her experience.